【4-STAGE SMART CHARGING - FULLY AUTOMATIC】 Smart battery operated with 4 stages automatic charging process by MCU controller, 25%/50%/75%/100% to indicate quantity of electricity and monitor the whole charging progress and automatically stop when the battery is fully charged. LED indicator designed to display different charging status. 【BMK 100% MONEY-BACK GUARANTEE】BMK offers lifetime quality warranty, considerate and timely after-sale services, eliminating all your worries about getting this smart battery charger. 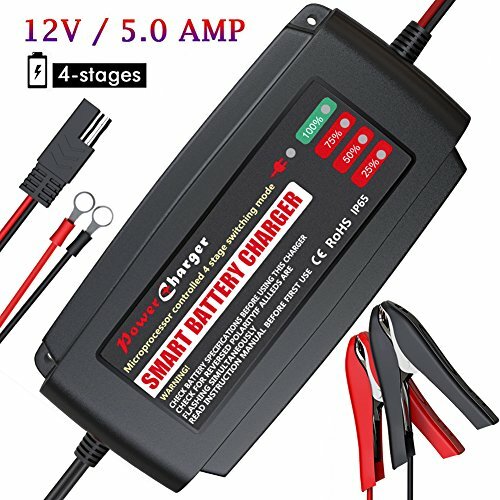 Just get your Automatic Car Battery Charger Maintainer with confidence! If you have any questions about this product by BMK BLUEMICKEY, contact us by completing and submitting the form below. If you are looking for a specif part number, please include it with your message.